Inglis Dam & Island Recreation Area is a part of the Cross Florida Greenway that extends for 110 miles from Yankeetown on the west coast to just south of Palatka on the St. Johns River near the east coast of Florida. Inglis Dam is one of two spillways that block the natural flow of the Withlacoochee River and form Lake Rousseau. Regulation of these spillways splits the downstream flow between the original river basin and the bypass canal. A public parking area is available on the south side of the Inglis Dam. 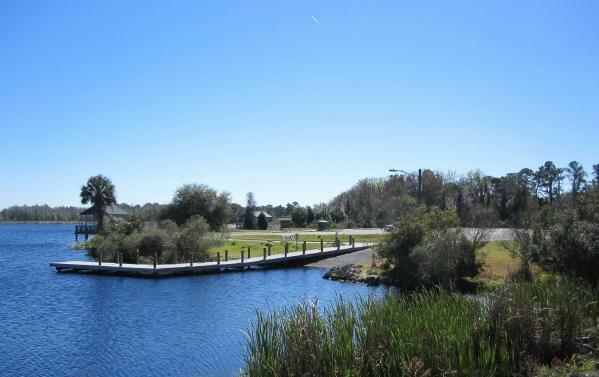 A paved boat ramp provides upstream access to Lake Rousseau for canoes, kayaks and motorboats. Several picnic shelters are also near the parking area. An additional parking area is also located south and downstream of the dam. A ramp at that location provides access to the Withlacoochee River as it flows about 1.5 miles and then joins the bypass canal. The river at this point is normally brackish with a tidal flow ... but may have high freshwater flows when there is a a significant discharge from the spillway. Fresh and saltwater fish, as well as manatees, may be found in this section of the river. The Inglis dam provides a bridge to the south side of Inglis Island. The island has a 2.3 mile long 12 foot wide paved multi-use trail suitable for hiking, bicycling or rollerblading. There are an additional 7.6 miles of natural surface trails that may also be used by horse riders. Horse trailer parking is available on the island with advance notice. See the State Park website (link below) for contact information.